Game of Thrones has been the inspiration for many things. Fan fiction, slash fiction, toys, board games, household goods, Halloween costumes, artwork; the list goes on and on. And, now, we can take a look at one form of Game of Thrones inspired art that most of us would never even have thought of. What is that, you ask? Why, it’s a very artistic dire wolf, along with the famous Game of Thrones/House Stark slogan Winter Is Coming. This screenshot comes from a video taken by Sky Atlantic which was posted to their YouTube page. And, yes, if you’re wondering, that is snow. What we have here, people, is snow art. The House Stark sigil is quite important going into Season 6 of Game of Thrones. The Starks are, as usual, all screwed up. As we all know by now, Jon Snow is dead as a doornail after being attacked by the rest of the Night’s Watch who were pissed that he forced them to combine forces with the Wildlings and let them, including some pretty scary and nasty tribes, past the wall. Poor Sansa Stark, after trying to regain some control over her life and almost succeeding, was married off to Ramsay Bolton. Desperate to get away, she and a newly determined Theon Greyjoy jumped off the top of castle Stark in a snow bank that may or may not have easily broken their fall. And, Arya, after finding the House of Black and White and playing along with their rules for a little while, took it upon herself to kill one of the (many) people on her I-must-kill-them list. Of course, her boss, Jaqen finds out and is none too pleased; Arya was struck blind the last time we saw her. 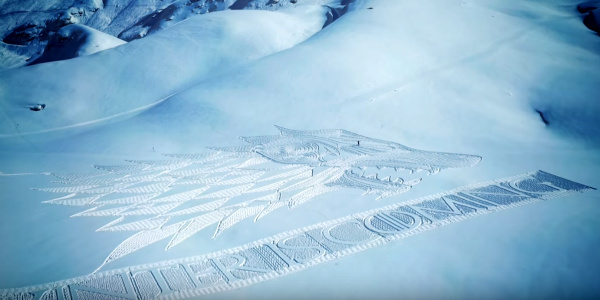 Snow artist Simon Beck created this masterpiece by walking the entire length of the artwork; it’s essentially art via foot prints. Beck uses snow shoes to tamp down as much snow as possible as he walks his art into the landscape. According to Digital Spy, Beck walked for 13 hours steadily, even through the night, in the heavy snow of the Alps to complete his work of art. His 64,800 footsteps led to a mammoth House of Stark sigil that covers a piece of land equivalent to the size of two and a half soccer fields. Simon Beck started making his complex snow designs in 2004, and they usually take up to 12 hours to finish, covering a space between 2.5 and 10 acres. You can see more of his process below. Amazing. Well, combining all the Stark troubles of Season 5, it’s obvious that winter really is coming, probably especially for them. It looks like a House of Stark sigil done in snow was a perfect idea.